In this cooperative game, players must launch a Grand Fireworks Finale! Players can see what cards everyone holds... except their own. Working together, they must give and receive vital information to play cards in the proper launch sequence. Light them all to create a dazzling display and avoid a fizzling fiasco. 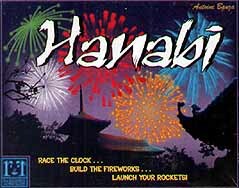 Hanabi (the Japanese word for fireworks) is a cooperative card game of 2-5 people seeing players trying to put coloured cards in the right order to create the perfect firework show. I will not lie the game is for me very theme light but I will admit that this is incredibly clever, it’s very easy to learn, but I found difficult in practice. The card deck consists of five different colours of cards numbered 1-5 in each colour. The goal of the game is to place five piles in each colour in their numerical order in this I would compare to solitaire but not as simplistic. Each player is dealt a hand of cards but has to hold them facing the other way so everyone else can see your hand, except you. There are three actions a player can take on their turn, either * Play a card to the centre of the table, if it's in the wrong order in a row, the card is lost and the team loses one of its limited lives. * Use a clue token. This allows players to give hints as to what another player has in their hand. *Discard a card to regain a clue token. The clues you give and to who are what make a game. You can only give either colour or number clues per token such as "these cards are 3's" or "those two cards are red" but not both. The order you give hints to set players up for turns is important as you have limited tokens and leaving a player with a turn and no information can ruin your end score as there are limited cards in each number so you can easily lock yourselves out from being able to finish a run or two if you discard the wrong ones. The cards are nothing special, I would class as standard playing cards that come in a pretty small box of decent quality. Overall I would class this as a good family weight game which is very portal so great for gaming on the move. All in all it's a cheap fun little game with a wide audience. Recommended. * Easy rules but turns requires some thought. * Nice travel size. * Interesting concept.